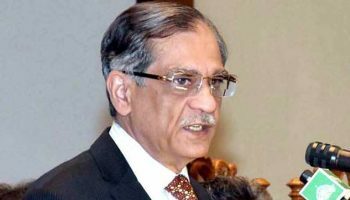 LAHORE: Chief Justice of Pakistan (CJP) Justice Saqib Nisar on Friday ordered Punjab inspector general (IG) to personally investigate the firing incident and alleged torture on police personnel at the dera of newly-elected lawmaker of Pakistan Tehreek-e-Insaf (PTI), Nadeem Abbas Bara. Hearing a suo motu notice taken on celebratory aerial firing and alleged physical abuse on policemen at the dera of Bara, who has recently been elected from PP-161, the top judge ordered the IG to investigate the matter himself, remarking that he knew the police high-up was an honest man and would submit a detailed report in this regard. Assuring him of a detailed investigation at the Lahore Registry of Supreme Court (SC), the IG informed Justice Nisar that most of the accused had already been arrested and were currently remanded into police custody. Nadeem Abbas’ lawyer, at the occasion, took the stance that the SP concerned had registered a bogus case for he had a “personal grudge” with Bara, to which the CJP remarked that all facts would be out in the open following a complete investigation. It merits mention here that Nadeem Abbas celebrated his victory in the July 25 polls through aerial firing, a video of which went viral over the internet. The CJP had earlier taken notice of the incident and ordered Bara’s arrest, after which the newly-elected MPA had surrendered to the police.